Biomathematics tries to describe biological processes with mathematical methods. It thus forms the basic framework of modern biology. The Biomathematics course is free of admission! Biomathematics is a Bachelor's/Master's programme. In the regular 6-semester bachelor's programme, students learn the basics of analysis, linear algebra, stochastics and discrete mathematics. In addition, the student acquires basic knowledge in general biology, biochemistry, biotechnology, genetics, ecology, chemistry and computer science. Biomathematicians conduct research in the biosciences, in particular in microbiology and molecular biology, but also in ecology, medicine and pharmacy. Are you interested in biomathematics? 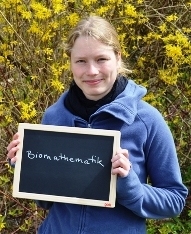 Lizzy is 26 years old and talks about her studies of biomathematics in Greifswald, about our city and what she does after graduating.